Full disclosure here, folks…after my hubby snapped these outfit pics on our balcony, I couldn’t get back inside fast enough to exchange my long cardigan for a warmer coat before I actually headed out for the afternoon!! Thank goodness that I’d planned to model my adorable new hat for you, though!! This handknit woolen beanie was a little treat I brought home for myself from the Circle Craft Christmas Market last weekend …and even with the windstorm aside, I think I couldn’t have made a better choice!! I’ve still got my fingers tightly crossed that Vancouver has another mild winter this year; but if we don’t, at least I have my “head game” covered…literally!! Remember – today isn’t just Friday…it’s Fun Fashion Friday!! 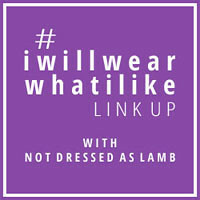 I know my blogger bestie Dawn of Fashion Should Be Fun would be thrilled if you joined her linkup party!! I love hats with buttons! In fact, about 8 years ago I went wild with a grey beanie I knitted and then adorned with my collection of little white buttons I had received from both my grandmothers. It's a pretty fun hat. . . your's is classier though. We ARE blogging besties … and always on the same fashion wavelength, Chick! Look at us in our plaid dresses! Where did you get that fab dress? Is it flannel? I wish mine was so it would be warmer, though weather never stopped me from wearing something cute. 😉 Have a wonderful weekend, Monika! One of your best outfits ever. That beanie is perfect!